I’m sitting in our hotel room in Oaxaca recounting the last week of riding while listening to the sounds of doves calling in the courtyard. They have a call like the white wing doves at home in Arizona. I open my eyes and see the view from my studio: Baboquivari across the valley and Tucson to the north. I must be dreaming; I can almost smell the desert air. My mind and body are restless. I know I cannot be two places at once. The words “the long and winding road” keep floating through my thoughts, over and over—the road is endless. I pedal forward but the view keeps getting further away. I’m not flowing with time anymore. This is what happens when you do not flow with time—it goes on with out you. My thoughts begin to move backwards, endless memories of home play in slow motion: the sunsets, the rabbits, lizards, and wasps …a snake fly lands on my wineglass and I remember how much I love the snake flies, but I do not want to go home. I want to ride my bike. I need to keep moving. I did not get the name OnnaMove for nothing. These slow days leave me restless. Two weeks in a city leaves me restless. I need to be inspired so I start looking at other routes …a route to the beach perhaps? But while I do enjoy a good beach, my true love is with the mountains. We left Juxtlahuaca early and rode to the edge of town where our road led into the mountains. It didn’t take long before we found ourselves winding through the mountains on a good dirt road. At the top of the pass after Juxtlahuaca. It was already hot by the time we reached the pass, but thankfully there was a long downhill to cool us off before making our way back up a few smaller climbs. It was a perfect day of riding that finished with a fast descent into San Juan Mixtepec. We checked into the hotel for the night, and then headed into the Centro in search of dinner. It was still early so the restaurants hadn’t opened for dinner yet, but after a few inquires we happened into a little tienda where the guys handed us beers and we chatted away the evening. We got an early start the next morning, watching the sun rise over the mountains as we headed out of town. Kevin started feeling sick so we took several long breaks over the course of the morning. By mid-afternoon we dropped down to creek, then back up a big climb before making our way into Santiago Nanduchi in the late afternoon. Local woman tending her field. A slow rumble rose over the hills as we approached Santiago Nundiche; the skies grew dark. We sat under the porch of a small tienda; my body craving fresh produce after days of tiny stores stocked with only packaged snacks. The options were the same: chips, cookies, ramen, but I was still thankful for the hot cup of noodle soup. The rain started, and then dumped in earnest. A river ran through the streets. We asked around for a place to stay; the comisario directed us to a covered porch across from the church and said we could sleep there. The town was quiet, “muy tranquilo” as locals often say. I watched the rain pour over the porch, swallows flew in and out, bringing bits of food to their young. The rain subsided, briefly, and a rainbow appeared behind the church. Night fell, and I stared into the darkness contemplating what I was doing here. We woke the next morning and made an early exit from town, watching the sun rise over the clouds. We stopped at the edge of town to make coffee, eat, and find a private patch of forest (since there were no bathrooms where we slept). All in all it made for a slow start to the day and it was already hot by the time we got rolling. We followed good dirt roads through the mountains, passing a few small towns along the way. Late in the day we found a beautiful place to camp, up a hill, nestled between a forest of mixed trees and fan palms. As the sun set we were visited by waves of flies, then mosquitoes, and then large flying beetles. I fell asleep to the sounds of the beetles flying, like tiny helicopters buzzing the tent. We got a late start the next morning and slowly made our way through the mountains. Kevin’s chain kept popping off his gears. Neon tried adjusting the derailleur, but it remained fussy. We limped into Santa Maria Tataltepec around noon, having only ridden ~11 kilometers for the day. Kevin was feeling even sicker by this point, so we spent several hours hanging out on the porch of a small tienda. As the afternoon grew hotter we moved to the church yard under the shade of a large tree, resting for a few more hours before deciding to ride a few more kilometers to find camping. Kevin’s chain snapped and broke after leaving town. Neon managed to make a temporary repair, removing two links and reusing a pin and a quick-link since Kevin didn’t have any spare parts. Being only a temporary fix, not knowing how long it would last, we decided that it would be best if we could hitch a ride into Oaxaca the next day when we got to the next village. Neon woke several times in the night feeling sick. The next morning we got an early start, and limped our way into the next village, Yutanduchi de Guerrero. We made it to Yutanduchi de Guerrero by early afternoon and hired a ride to take us to a small town on the main highway near Oaxaca where we could catch a bus the rest of the way. Let your food be your nourishment and your nourishment be your medicine. We strapped the bikes into the bed of the truck, but they still suffered a bit of damage on the way to the next town. The sheath on my derailleur cable took a hefty beating wearing down it down to the metal, and Kevin’s tire had gotten rubbed so hard that it had frayed in two places almost having rubbed two holes in the side walls. It was a two and a half hour ride down a rough dirt road. Within twenty minutes of arriving in the town we bought bus tickets and loaded our bikes (in a heap) under the bus. We made it to Oaxaca and found a hotel by early evening. And of course we found a good coffee shop. We spent two weeks in Oaxaca. We visited the cultural museum, the museum of modern art, the pre-Colombian art museum, several art galleries and artisan shops, and Monte Albán. Our visit to Monte Alban had me contemplating the ancients. I sat and stared at the landscape and the ruins, and wondered what life would have been like during the time it functioned as a great city. Monte Albán was one of the earliest cities in Mesoamerica, founded around ~500 BC. It became the Zapotec capital of the Oaxacan Highlands, and grew to be one of the largest cities in Mesoamerica with a population of ~17,000. The city lost its political control of the area around 500 AD, and by ~1000 AD it had been mostly abandoned and replaced by smaller polities. …packing up Kevin’s bike for his flight back to the U.S. 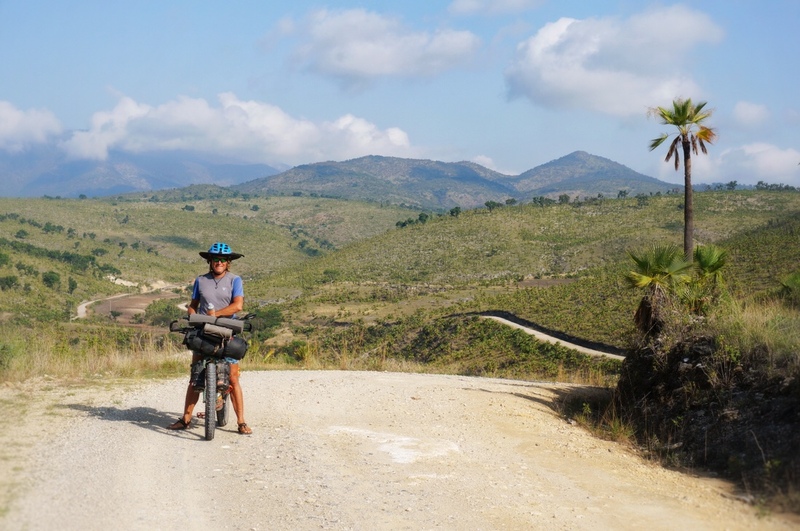 He got a well rounded experience of our ride south, including Aztec and Zapotec ruins, highway riding, dirt road riding, hike-a-bike, riding through rural Indian villages, and some city site-seeing. We spent one more night in Oaxaca after Kevin caught his flight back to the U.S. I briefly entertained the idea of heading south to the beach, long enough to feel inspired again, but in the end the mountains always win. Great story and admiring you taking the back roads in Mexico. We never felt brave enough for long streches of dirt, only minor parts. Thanks for the beautiful pictures! Every vehicle finds its point of screaming out “FIX ME, NOW! !” Oaxaca looks like a perfect place to hang out- if one has to stay for an extended period. I love an active city centre, so the Zocalo would be refreshing!